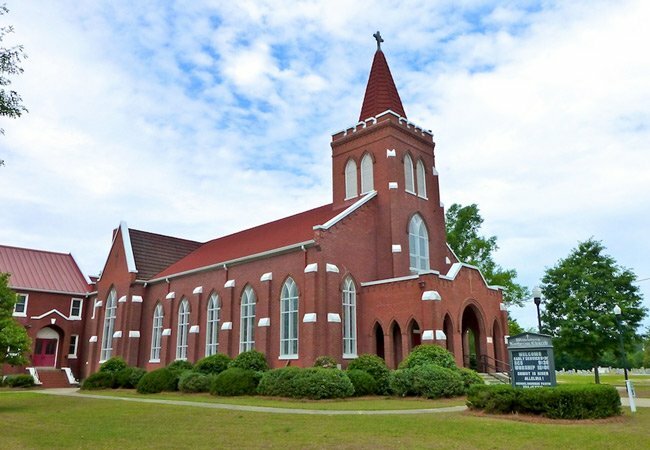 This congregation was established in 1870 in what was then Leesville (now consolidated into Batesburg-Leesville) by the Reverend Samuel Bouknight, making it the first church of any denomination to organize in the former town. Many rural churches initially met in brush arbors prior to securing property and a building, and this Lutheran church was no exception. However, the congregation soon found shelter in the second floor of a blacksmith shop until a local Methodist – David Shealy – donated a lot for a church building. The congregation exchanged the lot for another one, and by 1874, members had built a simple frame building along with a parsonage and cemetery, calling its church Luther Chapel. In 1887 a newer church replaced the first one, but by the early twentieth century rising membership necessitated the construction of a larger church on a nearby site. By 1918 this modern brick church was complete, and the congregation elected to change the church’s name to Wittenberg Evangelical Lutheran Church in honor of the birthplace of Lutheranism – Wittenberg, Germany. The Leesville College Historic District is historically significant for its association with two early Leesville schools. The district includes the first school in Leesville, the Busbee Brothers’ School, founded in 1878, and three buildings associated with the Leesville English and Classical Institute, founded in 1881, which became Leesville College in 1890. Also included in the district are residences constructed by persons associated with the schools. The district includes twenty-eight residential and institutional properties, in a contiguous neighborhood that is separated by an intervening block of new commercial development from the town’s Main Street commercial core to the south. The district evolved as a residential enclave around the Busbee Brothers’ School and the Leesville English and Classical Institute. Frame construction, weatherboarded, with varying articulations of ornamental trim, is ubiquitous. The houses of the district cover a wide range of Victorian vernacular forms, from modest cottage to elaborate residence, but the scale of the buildings, the materials, the setbacks are consistent. Other stylistic examples include Queen Anne, Gothic Revival, and Neo-Classical.